PRODUCT: MasterSeal NP1 (formerly Sonolastic NP1) One-Part Polyurethane Caulking Sealant, SPECIFY COLOR, 10.1 oz / 300mL Tubed. 30 Tubes/Case. 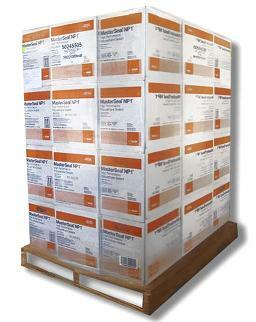 48 Cases/Pallet (1440 tubes). Price/Pallet. FEATURES: MasterSeal NP 1 Polyurethane Sealant (formerly Sonolastic NP1; its the same product. The worlds most popular exterior Sealant formula. Extremely weather resistant. One-component high-performance gun-grade moisture-curing polyurethane sealant. 800% elongation, 350 psi tensile and +/- 35% joint movement capability. NP-1 handles most every exterior application up to 1-1/2" wide joints. NP-1™ bonds well to most construction materials without a primer, including concrete and masonry. NP1 dries with a smooth, paintable finish. NP2: can be custom tinted or accelerated for faster cures. NP2 handles joints up to 2 inches wide. Requires mixing and bulk dispensing equipment. 20 Ounce Sausage Packs, 20 sausages per case.